Inside we have a wallpaper showroom, stock numerous decorating accessories and essentials, and display a good range of trade and designer paints. You can also use our customer internet terminal to order more products into store, usually arriving within a day or two. Our small team is cheerful and helpful; we know our products and we’ll do anything we can to get you what you want, so please do feel free to ask. We pride ourselves on the strength of our customer relationships and have a large number of trade customers in particular, although we’re just as retail friendly! 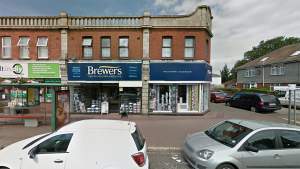 There are two Brewers Decorator Centres in Bournemouth – Wimborne Road and Holdenhurst Road – as well as our Poole branch, so painter decorators in the area are spoilt for choice. Our Wimborne Road store is on the corner of McClaren Road and Wimborne Road in a beautiful red brick building with dedicated customer parking round the back of the shop. Travelling from Castle Ln W, with the church on the left, take the next right. Travelling along Wimborne Road take the next left after Tennyson Road.